Piping Material for Your House—Time to Replace It? Adjusting the Thermostat? Here’s Why Your Home Is So Hot! Pushing the thermostat down lower is wasteful of energy and doesn’t give you better cooling, it only keeps the AC compressor running for longer. This situation is a warning sign something may be wrong with the AC. 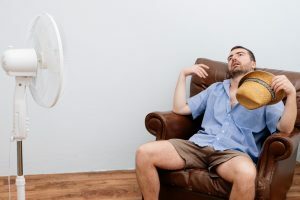 We want you to end the summer in a relaxed home environment, so we have some suggestions for why you may have a hothouse this time of year. If you need air conditioning repair in Staten Island, NY to solve the temperature trouble, you can rely on our technicians to get the job done. Here’s a problem you might be able to solve fast on your own. Check the air filter on the HVAC cabinet (usually located where the return air ducts connect to the blower on the cabinet). If the filter has large clots of dust, lint, and other debris in it, change it for a clean one. We recommend changing the filter every 1–3 months to prevent a clogged filter from cutting down on airflow and making it harder for the AC to cool the home. It may be the reason adjusting the thermostat so often isn’t resulting in a cool house is the thermostat itself is broken. If a miscalibration causes it to sense incorrect temperatures, it won’t control the AC’s cooling to your satisfaction. HVAC experts can repair or replace the thermostat. No, the AC doesn’t consume refrigerant as it runs, since it isn’t a fuel source. The same charge of refrigerant remains for the life of the system. However, leaks on the refrigerant lines can occur, and the drop in refrigerant will cause the AC to lose its cooling power. If the leaks are left unsealed and the refrigerant isn’t replaced, the air conditioner will suffer from catastrophic damage—so don’t wait to call for repair professionals. The ducts can also spring leaks because of spikes in air pressure, corrosion, poor ventilation construction, even insects and vermin. These leaks allow cool air to escape before it reaches the room, creating hot spots in the house. It will also let humidity rise. HVAC technicians can test the ducts to determine if this is the problem, then handle the work to seal them. Is your air conditioner more than 10 to 15 years old? When an AC gets that old, a loss of cooling often means it’s starting to fail. Repairs may allow an older AC to hobble along for a few more years, but we suggest applying the Rule of 5,000 as a test: multiply the cost of a repair by the age of the air conditioner, and if the result is greater than 5,000, a replacement is a more cost-effective option. However, let a professional survey the system and give you an informed opinion on the best course. Find the AC help you need: Scaran has served Staten Island and its neighbors since 1930.